1) RootsTech 2018 was the only highlight during the week of 26 February. I summarized my takeaways in RootsTech 2018 Potpourri - My Baker's Dozen Takeaways . 2) Although we have been home for a week, Linda and I have been sick all week and weekend, and are still exhausted from coughing, blowing, and napping. This has significantly reduced my research and writing time so that I have done little but blogging in the past week. I missed the San Diego Genealogical Society program meeting and the Chula Vista Genealogical Society Board meeting. 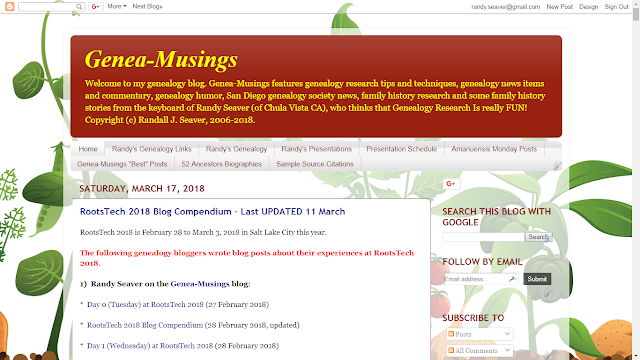 3) I managed to update the RootsTech 2018 Blog Compendium - Last UPDATED 11 March post every day. 4) I participated in the 5 March and 12 March editions of the Mondays With Myrt webinar. In today's webinar, we discussed genealogy software - from reasons to use it, how to input persons, adding events, creating a GEDCOM file, adding the GEDCOM to a new Ancestry Member Tree, seeing Ancestry Hints, syncing and more. Pat used RootsMagic to demonstrate these features. 5) I have 264 Shared Ancestors on my AncestryDNA list (I had 255 two weeks ago), 783 4th cousins or closer (up from 760 two weeks ago), and 681 pages (over 34,000 matches with at least 5 cM) (was 649 pages two weeks ago) of matches. I have 12 matches that are third cousins or closer, and 90 matches with 34 cM (0.5%) or more (was 86 last week). My highest match has 779 cM (11.5%), and is one of my first cousins. I have 18 DNA Circles (up from 15 two weeks ago). There were two new close matches (both first cousins twice removed). Very few of the new matches have an Ancestry Member Tree. 6) I have 3,101 DNA Matches on MyHeritage (up from 2,886 two weeks ago) with at least 8 cM (0.1%), with 25 matches with more than 34 cM (0.5%) or more (was 25 two weeks ago). The highest match is 184 cM (2.5%). Most of my close matches have very small trees with no common ancestors shown. 7) I have 1,097 DNA Relatives on 23andMe (down from 1,119 two weeks ago) who share at least 0.10% with me. Of these, only 1 shares 1.0% or more, and 38 share 0.50% or more (was 36 two weeks ago), with the highest match being 1.54%. I struggle to find out anything about most of these testers. 8) I have 2,464 autosomal DNA Matches on FamilyTreeDNA (up from 2,412) who share 0.25% (18 cM) or more, with the highest match being 96 cM (1.42%). I have 12 who share at least 1.0% (68 cM) with me, and 1,332 who share at least 0.50% (34 cM) or more (was 1,303 two weeks ago) with me. I have had better luck finding shared ancestors here with a few of these testers. 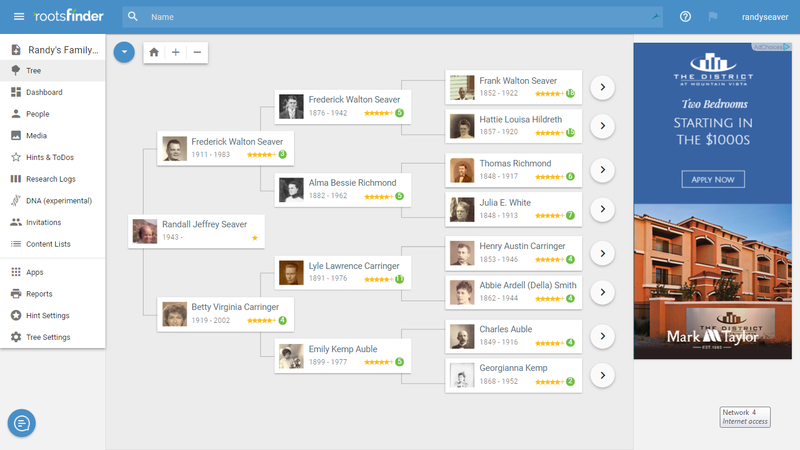 9) There were occasional sessions working in RootsMagic to update FamilySearch Family Tree profiles for Seaver families and other database families, with occasional additions to the RootsMagic profiles. I have matched 22,817 of my persons with FSFT. I now have 49,721 persons in my RootsMagic file. I TreeShared several times during the last week. There were also several sessions in Ancestry Hints to add content and source citations for the new RootsMagic profile additions. I've fallen behind on the Record Hints with 58,636 waiting to be resolved, but I'm working on them. Every time I add something to RootsMagic and TreeShare, the Hints multiply.